A team of electrical engineers has come up with a method for counting the number of people in an area based solely on how the power requirements of a Wi-Fi network fluctuate, with many diverse applications. 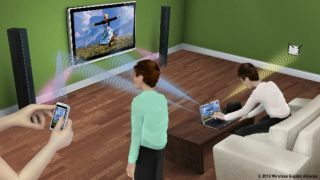 The researchers, led by Yasamin Mostofi, put two Wi-Fi nodes at the opposite ends of a 70-square metre space and examined changes in the wireless signal. When people crossed the beam between the two nodes, the Wi-Fi signal dropped slightly, and when they were off to one side they scattered the beam. By examining these two phenomena, the team was able to develop a probabilistic mathematical method for estimating the number of people moving around in the space - it's been tested successfully with up to nine people so far. "This is about counting walking people, which is very challenging," said Mostofi. "Counting this many people in such a small area with only Wi-Fi power measurements of one link is a hard problem, and the main motivation for this work." Given the ubiquity of Wi-Fi networks around the world, this discovery could be used in many fields. Smart heating and lighting systems could intelligently adjust their output based on the level of occupancy, while in search and rescue, a stricken office building could automatically report the number of inhabitants to disaster recovery teams. In the latter scenario, Mostofi is hoping to combine this work with her lab's previous work on imaging stationary objects and humans through walls using Wi-Fi signals. The results were published in IEEE's Selected Areas in Communications journal.